The Shall we date? story app series are very similar to those ‘Choose Your Own Path’ books that we loved as kids. The story in these story apps aren’t the adventure stories that those ‘Choose Your Own Path’ books were, though. 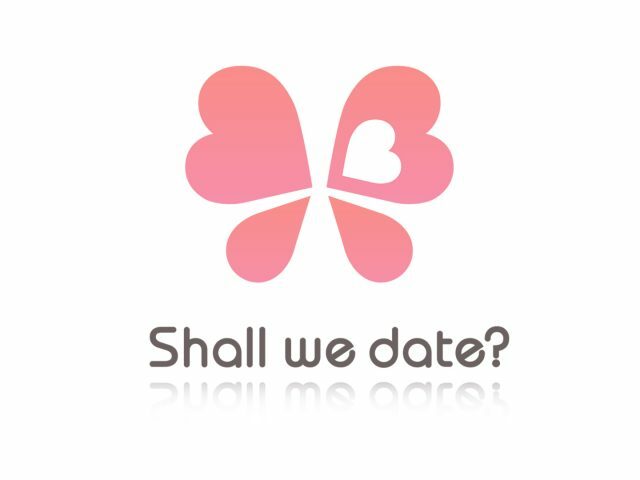 Rather, as the name of the series suggests, the story in the story apps of the Shall we date? series are in the romance genre. 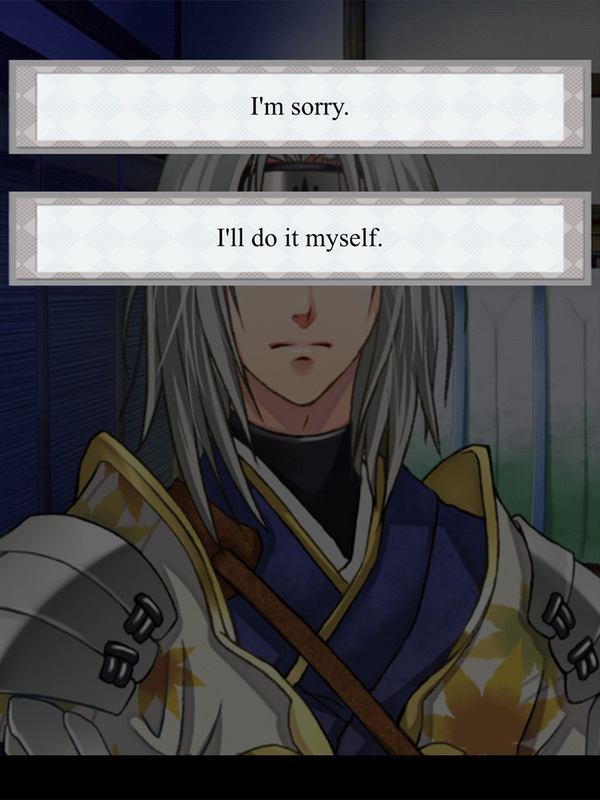 The main focus of the story in these story apps is romance and they ask for responses: ‘What will you say/How are you going to respond to his words?’ as opposed to ‘What will you do?’ Your choices don’t affect the story plot. It affects your relationship to the character you interact with. Your character is the daughter of an aristocrat family guarding the sacred jewels belonging to the imperial family. Whilst fleeing from enemies, you fall off your horse and become unconscious. Regaining consciousness, you find yourself in the middle of a battlefield with no recollection of who you are or why you are in the middle of a battlefield. 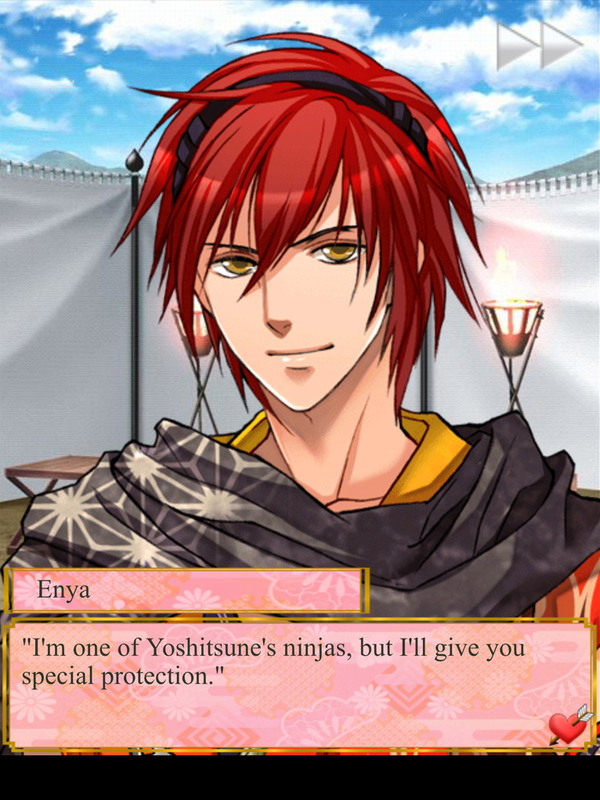 It is a dangerous place, but fortunately you are saved by a handsome ninja. The story is good. It’s simple and linear, but it caters well in developing the romance with your love interest. The story is in the point of view of your character. We’ve played Hattori Hanzo Kazemasa, Enya and Minamoto Yoshitsune so far: Hattori Hanzo Kazemasa is stiff and has a robot heart; Enya is the playful player who is quite reckless; and Minamoto Yoshitsune is the compassionate clan leader. Out of the three, our favourite character is Enya. Enya is very confident with women and he does try things on you. However, his most important person is his superior, Minamoto Yoshitsune: carrying out Minamoto Yoshitsune’s orders and doing well by Minamoto Yoshitsune is number one. Minamoto Yoshitsune is someone Enya highly respects—so much so, Enya comes across as thoughtless. Without a second thought, he can easily put you to use in a dangerous situation just to carry out and succeed in a task. 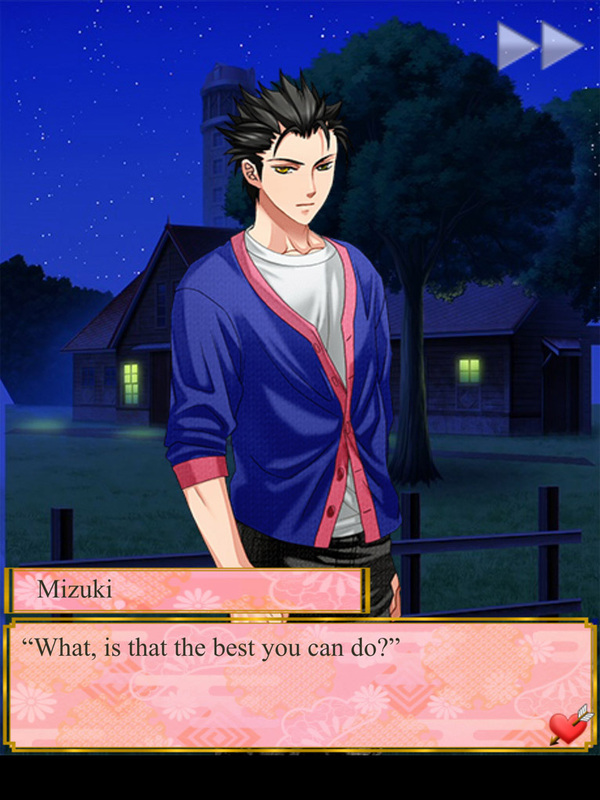 He will only realise he’s done wrong by you when he disappoints Minamoto Yoshitsune. 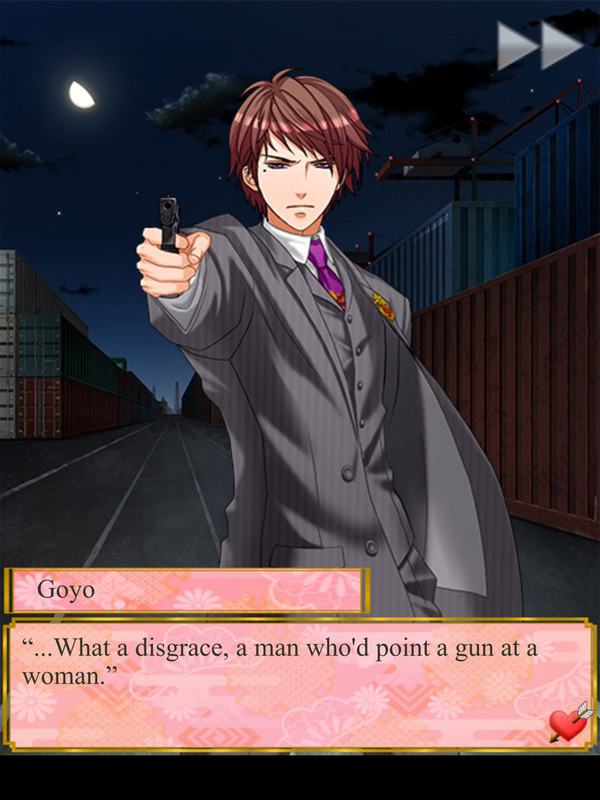 Minamoto Yoshitsune is the love rival in Enya’s character game and he has a role in flipping Enya’s heart. We played Enya’s character game twice and got Sweet Love Ending and Secret Love Ending. We enjoyed playing Minamoto Yoshitsune’s character game as well. This game was actually the game that had us using up a lot of our camellia rice cakes (energy item) in one sitting. Minamoto Yoshitsune’s story: he is an heir to his clan and leader of the ninja group that you become acquainted with. 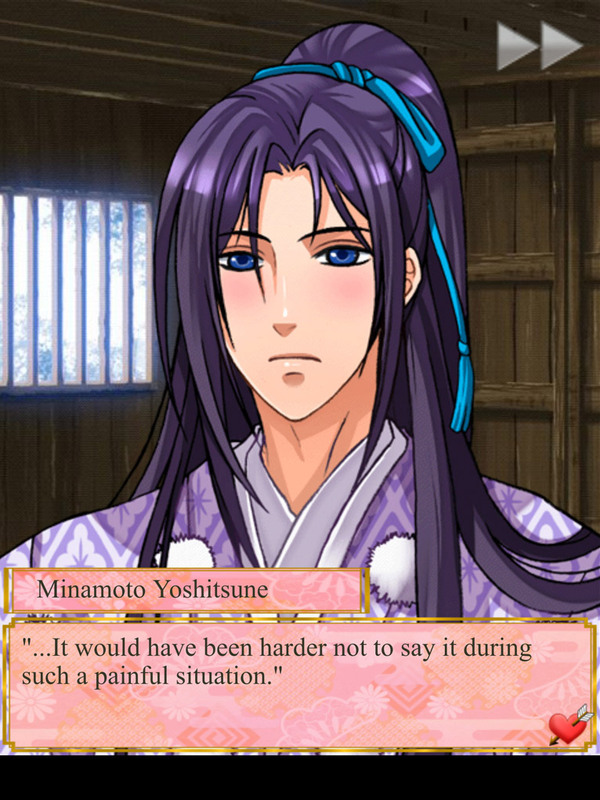 Even though Minamoto Yoshitsune is very kind and accommodating to you, he distances himself from you and never lets his true emotions and feelings show. He believes that, as a clan leader, he must always think about what’s best for the clan. There is no room for selfish wants or emotional engagement. 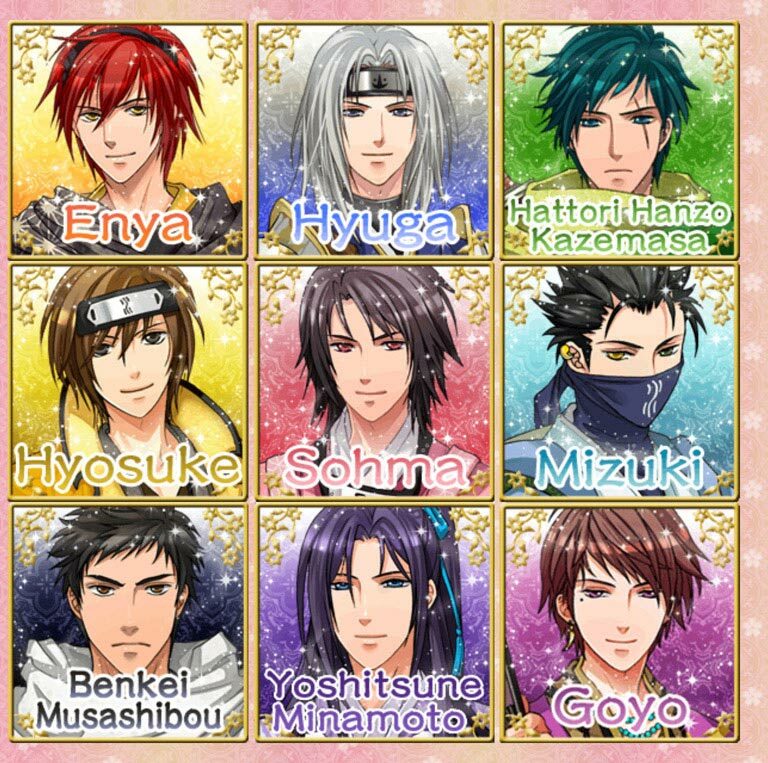 The love rival in Minamoto Yoshitsune’s character game is Benkei Musashibo. Playing Minamoto Yoshitsune’s character game, we got Secret Love Ending. Hattori Hanzo Kazemasa was our first choice of character to play. We didn’t know which character to pick even with the character descriptions because they all look so interesting when first playing the story app. And so, we just chose the character to play by looking at the character designs. Hattori Hanzo Kazemasa’s green hair stood out and we picked him to play first. Hattori Hanzo Kazemasa was a cold and distant character. He doesn’t open up and you can’t read what’s on his mind. Smiling is a rare sight Hattori Hanzo Kazemasa when he always sports a neutral expression. He’s the type of character that doesn’t ever let you know that he is looking out for you. He does it in the background without you knowing. When we finished playing Hattori Hanzo Kazemasa’s character game, we just thought it was okay because we felt that even at the end, Hattori Hanzo Kazemasa still had the air of rigidness that he supported at the beginning. 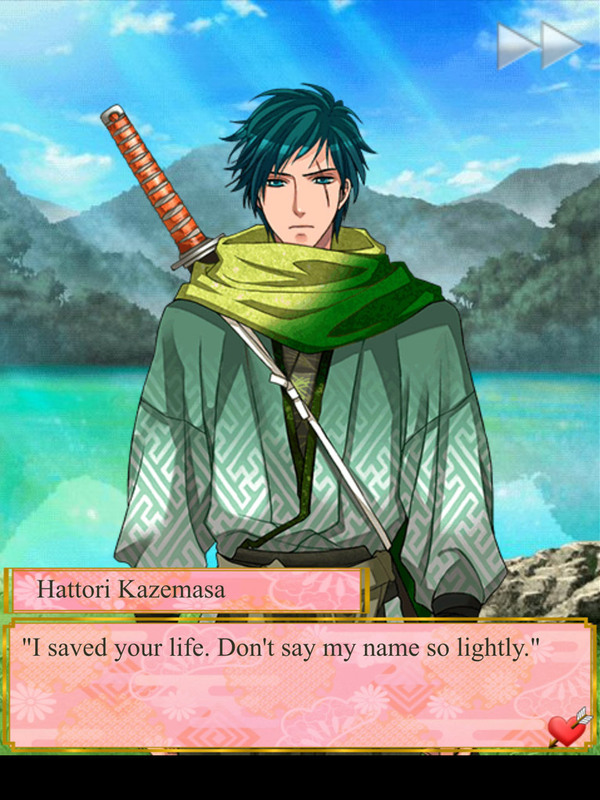 We can’t clearly remember the love rival in Hattori Hanzo Kazemasa’s character game. It could have possibly been Enya. Playing Hattori Hanzo Kazemasa, we got Sweet Love Ending. In all three character games, our character (the female lead character) is likable. Being a character with amnesia and us knowing that the character’s background will become an important aspect of the story creates excitement as we wait for this to be revealed to the ninja characters. The possible endings you get is fun. In this story app it’s not one that has a Normal Ending – Happy Ending – Super Happy Ending scale—of which the other story apps in this series have. Shall we date? 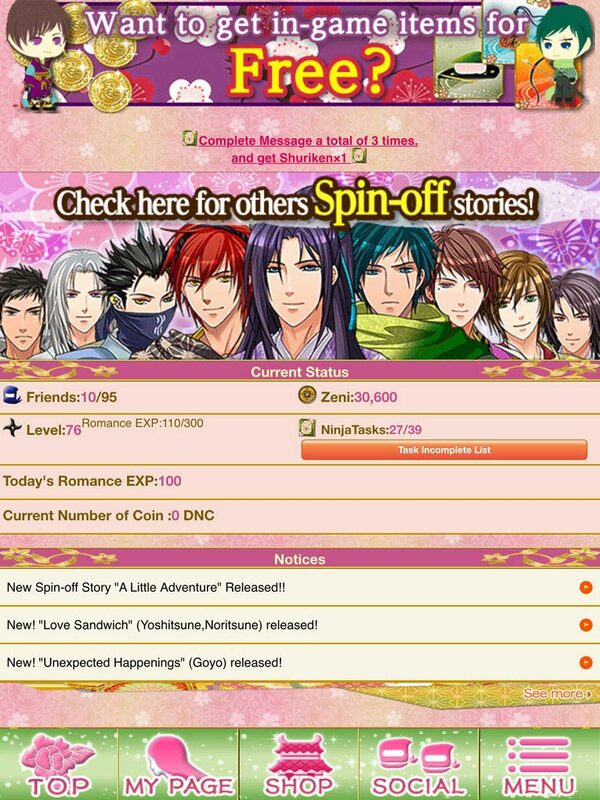 : Destiny Ninja has Secret Love Ending, Sweet Love Ending, Lovesick Ending and Hidden Love Ending. They do look like endings that get progressively better and the more your choices match the game’s choices the more likely you’ll move in the direction of the higher end of the scale of Sweet Love Ending and away from the lower end of the scale of Secret Love Ending; but, we find that we don’t feel like we have to get Sweet Love Ending over Secret Love Ending. 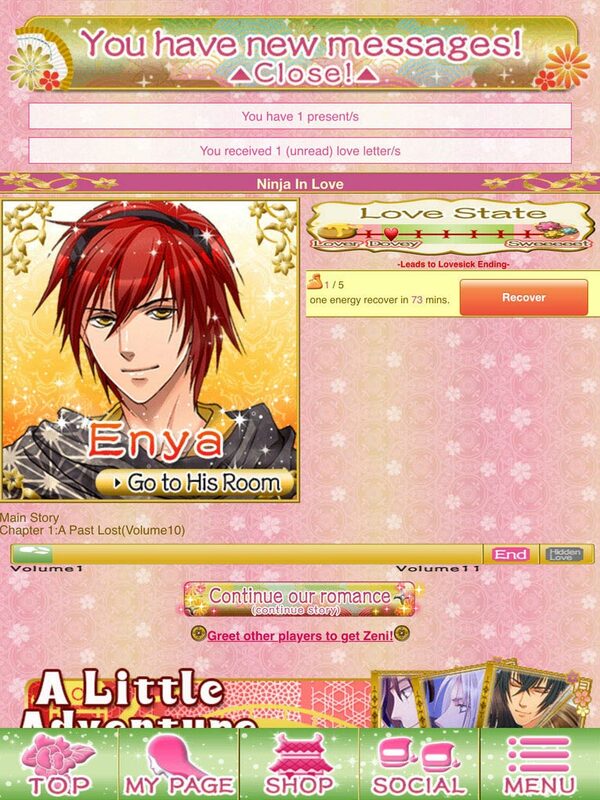 When we were playing Enya’s game, we found we liked Secret Love Ending more than Sweet Love Ending. For the other story apps in the series where they had the Normal Ending – Happy Ending – Super Happy Ending scale, we did find that the Normal Ending isn’t as good as the Happy Ending (We’ve never gotten Super Happy Ending, so we can’t say if it’s better than Happy Ending. It probably is, though!) And so, with Shall we date? : Destiny Ninja, it doesn’t feel like we have to think hard and choose the choice that best matches what the game says is the best and desirable choice so that we can get the ending at the higher end of the scale. We feel like we can just choose what we want and still get an ending that will be interesting and likable! We’ve not gotten Lovesick Ending (the heart has to be in the green zone closest to the side of the Lover Dovey end of the scale) or Hidden Love Ending (the heart has to be in the green zone closest to the Sweeeeet end of the scale) for any of the characters we’ve played yet. Hopefully, we’ll be able to get Lovesick Ending when we next play Enya since we sort of remember the selections for two of the four endings for Enya’s character game. We haven’t played the entire collection of the Event Stories and Spin-off Stories that’s free-to-read in this story app; however, we have played almost all of the free-to-read ones for Enya! Those that we’ve read are simple in plot. Some are longer than other, but they are short in length. They are definitely shorter than the main story! 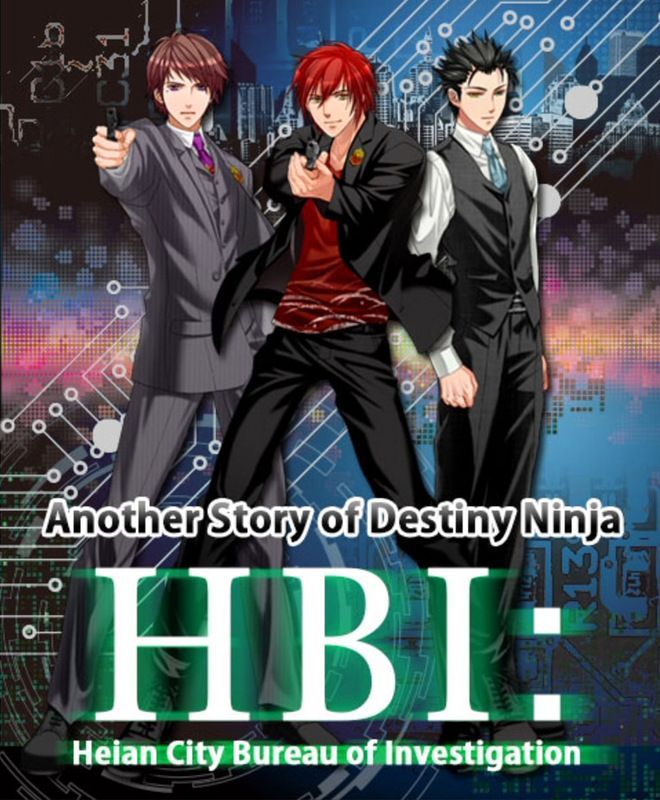 Our most favourite from this collection so far is the spin-off story called, HBI: Heian City Bureau of Investigation. This one is set in modern times. After playing all these stories set in historical times, it was refreshing to read a story in a modern setting and with characters in modern attire! 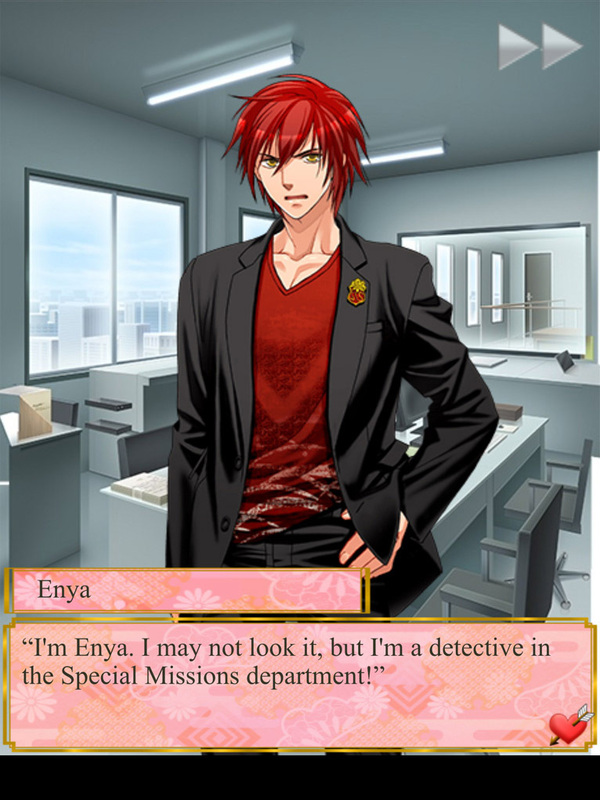 The characters available for pick in HBI: Heian City Bureau of Investigation spin-off story are Enya, Goyo and Mizuki. The story is: you have been transferred from the Traffic Division to the Special Missions Division in the Police agency and you come to work on a case with your partner. The case that you work on differs for each of the character games in this spin-off. Your relationship with your partner develops during working on your assignment. Shall we date? 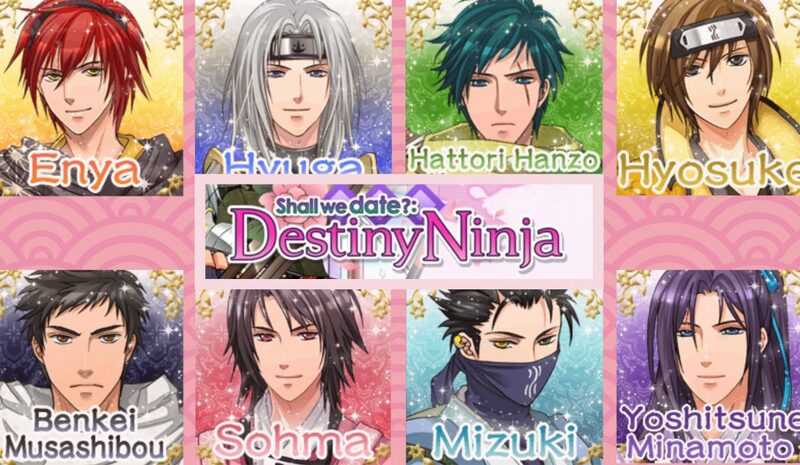 : Destiny Ninja is by far our favourite story app in the Shall we date? series. It is the one we play a lot. We love the style of the character drawings in Shall we date? : Destiny Ninja. We like that the characters have shoujo-like designs to the characters. We feel Shall we date? : Destiny Ninja is more popular and bustling than the others in the series. There are a lot more surprise gifts coming into the in-game mailbox, friend requests and events happening. Anyone playing Shall we date? : Destiny Ninja? What do you think of it? We’d love to hear from others playing this story app and hear about how you find the story, who your favourite character is, which is your favourite spin-off and event stories, etc.